The Black Sea Fleet will leave Sevastopol not due to the pressure from NATO but due to the pressure of the high prices for the Crimean land rent. The calendars do not lie but their originators thanks to the latter we can not be precise on the celebration of the 225th anniversary of the Black Sea Fleet whether on February 13 or May 13. Although the perspective is crystal clear according to the terms and conditions of the agreement the last seaman of Russian Black See Fleet shall leave the Crimea not later than 2017. Apparently it will happen earlier as the coastal land market increases with hypervelocity there are almost no spare land plots left except for the areas occupied by Fleet’s facilities. It seemed to be the main reason of political and economic pressure escalation upon the Black Sea Fleet from Kiev. 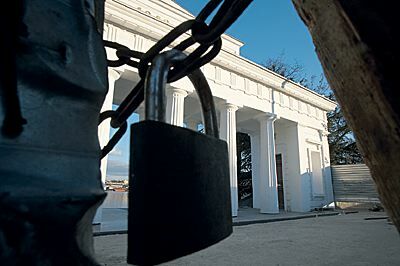 The entrance to the Grafskiy pier appeared to be locked – this is an unmistakable sign meaning the people of Sevastopol are planning to celebrate the 225th anniversary in the month of May. It is known in advance who is going to be a stranger at this anniversary namely about half percent of the population including military servicemen of the Ukrainian Navy, members of their families and the officials of the municipal administration who live in the heroic city as missioners. The legislative body the Sevastopol City Council as expected took a side with the majority and officially proclaimed Sevastopol “the territory without NATO”. Kiev as the reply threatened Council’s dismissal and snap election but instead of awaited fright they faced the protest rally encircled by the Ukrainian militia and Special Police Force hidden in the lanes. The more complete picture of the forces alignment we got while on the tour in a leased motor boat across the Sevastopol Bay. One part of the buildings in the city was decorated with the Russian tricoloured flags while another was flying yellow-blue banners of Ukarain as if on purpose for the proper adjustment of the artillery fire. To figure out the belonging of the ships anchored almost aboard was also an easy task. The Russian warships fly the flag with St. Andrew’s cross while the Ukrainian have hetman’s right-angled cross. 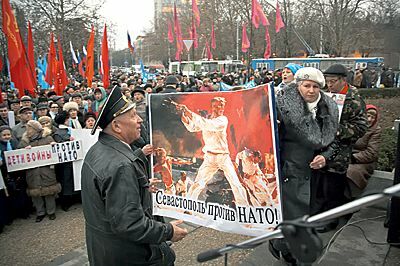 But the symbolism has got no practical value yet in the military view as for the competition between the ships once had a common flag of the USSR’s Navy then it is purely ritual meaning to make the most pompous parade or the most colorful fire-works. The Ukrainian colleagues won the “trophy” at the last parade but later were depressed by the foul weather. The November gale that rolled over the whole Black Sea sunk one Ukrainian motor boat in the very Bay and made another rip the side of the Ukrainian flagship Getman Sagaidachniy the latter was promptly towed to the yard’s pier. As the Russian Black Sea Fleet has got his eyes everywhere the Ukrainians could not hide the incident. But apparently the Ukrainian is also well served as it was informed that the gale did not show mercy on the piers in Novorossiisk built specially for the future redeployment of the Black Sea Fleet. The readiness of the Norossiisk naval base to receive the main body of the Black Sea Fleet is estimated in different ways. In the General Naval Staff “although not so visible the great amount of work had been completed”. The Ukrainian experts estimate the readiness of the base for 30 percents and consider the Russians will not be able to meet the deadline in 2017. 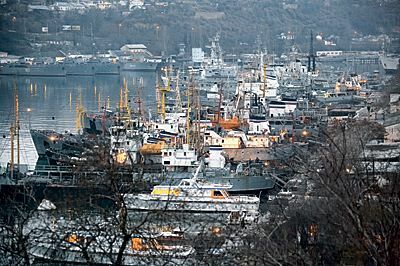 As long as there is no alternative to Sevastopol Bay then whatever is built in Novorossiisk the harbor is not suitable for the deployment of the Navy in fall and winter. And in circumstances of zero hour the Russian ships will find themselves in the open sea. Not less “important” relations have spread over other naval activities. We were assured in the Black Sea Fleet Headquarters "In the present condition the Ukrainian Navy is not capable to meet the challenges of traditional naval competence”. The Black Sea Fleet certainly shows higher mobility and seems still good at something taking into account the participation of the Black Sea Fleet’s flagship guided missile cruiser Moskva in the conjoint exercises with a detachment of the Northern Fleet. But the experts were not much impressed. Just a quick look on an aerospace photo of the Sevastopol Bay is enough to understand the former strength of the Fleet is nothing but phantom and yet an old one. For the last years the Fleet was strengthened with one ship only and furthermore not of the highest rank. The rest of the ships are in their late twenties and older and they are not subject to further upgrades any more. In the context of these aging problems Kiev has been developing a new concept to the issue of ahead of schedule redeployment of the Black Sea Fleet from Sevastopol. For instance a member of the civil party Pora proposed not to expedite the things and wait till the Russian ships rust so much and be incapable to take the sea. 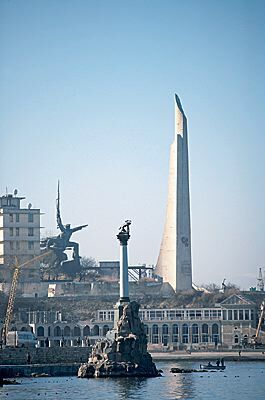 In his judgment it would give a real chance to convert the main base of the Black Sea Fleet into a historical site of the former Soviet fighting might and the earnings from the travelers visits would probably exceed the amount of about one hundred million US dollars transferred annually from Moscow for leasing of Sevastopol’s piers. On the threshold of the long awaited Ukrainian land law that will allow to transfer industrial areas into recreational ones the cost of a 100 square meters lot of Sevastopol’s coastline leased by the Russians has increased almost fivefold and come up to the costs of land in Moscow’s neighborhood – 10-15 thousand dollars per one 100 square meters lot. Somov is convinced that Sevastopol’s future is not bound with industry but with recreation and entertainment. Especially as the examples already exist in the area of Balaklava. There was a submarine base in the Soviet time and a top secret ship-repairing plant built inside the rock hanging over the harbor and capable to survive nuclear missile strike. A lot has changed during the years of the Ukrainian governance. The Englishmen our fellow-travelers whose ancestor perished at Balaklava yet in the Crimean War told us that the access to once closed town is free for a long time since. It is true as there are neither checkpoint at the entrance nor submarines and the in-rock plant has been converted into a museum. The local seafood no longer smells fuel oil and the crippled pier was replaced by smart promenade with seafood restaurants and yacht club along. According to available information the first who displayed interest to Balaklava was the daughter of Leonid Kuchma. She was later impudently hustled by a party-mate of the present prime-minister Yulia Timoshenko. After successive change of the governance the coast line once belonged to a shabby design institute partially involved in military needs changed the owner. 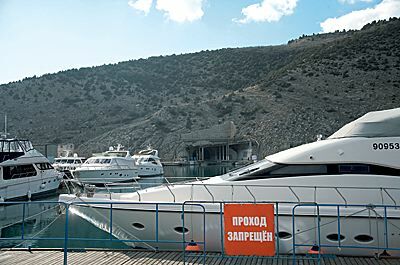 Now this a possession of Victor Yanukovich’s son who plans to build there yet another yacht club for the VIP’s. Rinat Akhmetov was also on the go and far-sightedly showed his intention to support the candidature of the current president and not Yanukovich. Now in Balaklava he owns not very profitable mine group only. But nobody is going to dig the soil for ever. On hearsay as soon as the land law becomes effective the worked-out upland is planned to develop into Ukrainian Las Vegas and the latter is expected to outmatch the Russian gambling center being built in Krasnodar Territory. Doubtless this thought-out campaign has views on Sevastopol as well (the leave of the Russian Black Sea fleet will spare 308 land lots with the total count of 3,328 hectares) and such views differ dramatically from the well know proposal of Yulia Timoshenko to encircle the rebellious city not subject to Ukrainization with the barb wire. What if the cruise tomorrow? Several days spent in Sevastopol gave us the understanding why the city irritates the Ukrainians so much. There is not a single signboard in Russian left, every last channel broadcasting in Russian was closed but the city stubbornly refuses to speak Ukrainian. “The Ukrainian community” in Sevastopol calls it nothing but “the rampancy of the Russian flag-waving” and of course Moscow’s influence will do no good. Meanwhile Ukraine (setting aside Byelorussia allied to Moscow) receives the Russian natural gas at the lowest price of 179.5 dollars per one thousand cubic meters. 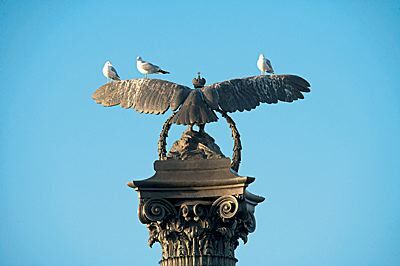 But even this price Kiev consideres unjustified. Yulia Timoshenko is going to lay the pricing issue on the tapis at the forthcoming February meeting in Moscow with the attempt to persuade to decrease the price or to insist on threefold increase of transportation tariffs as compensation mean. As Sevastopol residents will surely mention she has got two bargaining chips namely gas transportation monopoly and the Russian Black Sea Fleet. Kiev announced that inventory auditing of the Russian Black Sea facilities in the Crimea has been started already meaning the rental can be increased multifold from 97.75 million to 1.8 billion US dollars. Upon the featured “letter of threes” (President Yushenko, prime-minister Timoshenko, and Rada’s speaker Arseniy Yatsenyuk) to NATO’s Secretary General Yap de Hoop Sheffer regarding the readiness of Ukraine to expedite the process of Ukraine’s entry into the Alliance the Russian side noticed that such a step may lead to deterioration in relation between the two countries. The position of Moscow with regard to rental increase was commented by a counselor of the Russian embassy in Ukraine Vladimir Lysenko. According to the diplomat in case of continuous Ukrainian pressure on the Russian Black Sea Fleet Moscow can initiate renegotiation of Grand Agreement of 1997 that secures Ukrainian possession of the Crimean peninsula”.